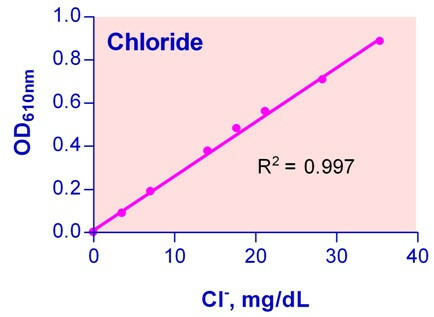 Chloride is the major extracellular anion in human body fluids. Chloride plays a key role in maintaining proper water distribution, osmotic pressure and electrolyte balance. Low chloride concentrations may be found with prolonged vomiting, extensive burns, metabolic acidosis, Addisonia crisis and renal diseases. Elevated chloride concentrations are associated with dehydration, congestive heart failure, hyperventilation and urinary obstructions. Determination of chloride in sweat is useful in diagnosing cystic fibrosis. Simple, direct and automation-ready procedures for measuring chloride concentration in biological samples are becoming popular in Research and Drug Discovery. BioAssay Systems’ chloride assay kit is designed to measure chloride directly in biological samples without any pretreatment. The improved Fried method utilizes mercuric 2,4,6-tripyridyl-s-triazine, which forms a colored complex specifically with chloride. The intensity of the color, measured at 610nm, is directly proportional to the chloride concentration in the sample. The optimized formulation substantially reduces interference by substances in the raw samples. Applications For quantitative determination of chloride ion and evaluation of drug effects on chloride metabolism. References Assay: Chloride in Mouse serum (Pubmed).